After adjustment for demographics and diabetes status, microbiome diversity linked to estimated GFR. 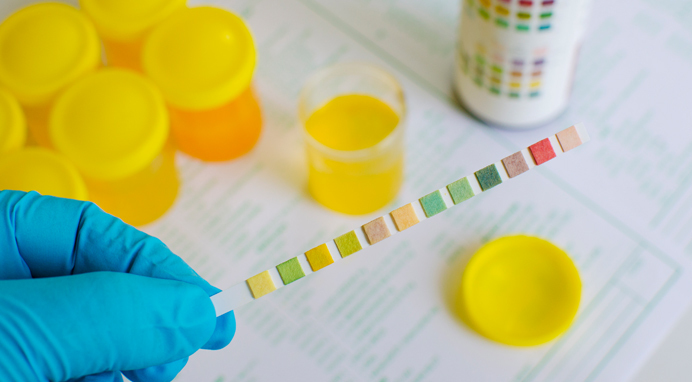 (HealthDay News) — Older adults with non-dialysis-dependent chronic kidney disease (CKD) have a diverse midstream voided urine microbiome, according to a study published online in International Urology and Nephrology. Holly Kramer, MD, MPH, from Loyola University Chicago in Maywood, Ill., and colleagues recruited patients with non-dialysis-dependent CKD and diuretic use. Using the clean-catch method, midstream voided urine specimens were collected. By sequencing the hypervariable region of the bacterial 16S ribosomal RNA gene, the bacterial composition was determined. The inverse Simpson, Chao, and Shannon indices were used to assess midstream urine microbiome diversity. A group of 41 women and 36 men had detectable bacterial DNA in their urine samples (mean age, 71.5 years). The researchers found that many midstream urine specimens were dominated by the genera Corynebacterium, Staphylococcus, Streptococcus, Lactobacillus, Gardnerella, Prevotella, Escherichia/Shigella, and Enterobacteriaceae. The remaining samples lacked a dominant genus. High levels of diversity were seen in the samples, as measured by the inverse Simpson, Chao, and Shannon indices. Participants with urgency urinary incontinence and higher estimated glomerular filtration rates (eGFRs) generally had higher diversity measures. Microbiome diversity correlated significantly with eGFR after controlling for demographics and diabetes status. Kramer H, Kuffel G, Thomas-White K, et al.Diversity of the midstream urine microbiome in adults with chronic kidney disease. Intl Urol Nephrol.